“Heart of a Teacher” by Parker Palmer is an enthusing article. I don’t disagree with anything he wrote in this piece. His article basically encourages an individual to be him/herself while teaching. Becoming a good teacher requires countless hours of trying to find one’s self and finding different techniques to connect with different types of students. Like Palmer said, “knowing my students and my subject depends heavily on self-knowledge. When I do not know myself, I cannot know who my students are.” An individual definitely needs to be honest and create a safe space where they are able to trust anybody about their struggles. Palmer quoted that “not all spaces can be safe, not all relationships trustworthy, but we can surely develop more of them than we now have so that an increase of honesty and healing can happen within us and among us”. Teachers aren’t the supernatural people who are able to painlessly get up in front of the class and have a smooth talk. To become a great teacher, one must learn through trial and error just like all the other professions. Heart of a Teacher and today’s class reminded of all the teachers I’ve had throughout my life. I’ve had many great teachers. But those who usually stand out for me are the ones that not only cared about me, but also made a difference in many of my classmates’ lives. My motivation to make a difference occurred with my 9th grade geography teacher. She was stern, but she deeply cared about everyone in the classroom. She was able to clearly present some numbers that were eye opening. Her tone was negative when she was doing her lecture, but the message she shared was the most encouraging for me. I’ve also had other teachers who were inspirational in different ways. Other teachers that come to mind are my 10th grade English teacher and 11th grade US history teacher. Their classes were tough, but they’re the classes that prepared their students for college. Most of my family members didn’t believe I was able to graduate from college, but my high school teachers did. My high school teachers informed that if I was working as hard as I am in their classes, I’d surely graduate from college. Whenever I thought about giving up, I’d remember my 9th grade teacher who asked us whether we are going to contribute to the dropout rate or graduate. I’d remember my history and English teachers who had faith in me. I still get inspired today whenever I’m having a tough time. Even though I have really enjoyed these past three weeks, I feel like we really need to spend more time to learn about multicultural education in Alaska. I appreciated Angie when she mentioned that this class isn’t over after three weeks. We will have to spend some time reading and learning in order to become effective teachers. Each student is raised in a different home, and teachers need to do what it takes to make them feel welcome no matter where they come from. As Lisa Delpit noted in her book, teachers need to educate students by finding positive ways to connect to their own culture. Delpit also said that if an individual is struggling in school, appropriate instruction in school could resolve the problem. But the answer is not a “quick fix” solution. It will take a continual effort. We will have to learn who the children are, their cultures, and their interests. We will have to make our classroom like a family. We will have to make the students feel valued if they excel or made effort in doing so. It might even take building lifelong relationships in order to make a difference in their lives. The students in our classroom might never get the acknowledgement they receive in our classrooms. We will have to treat the school year as if it’s going to be the only year with our current students. When it comes to teaching strategies, teachers need to provide a safe place for each student. Students need to be given the opportunity to learn from one another just like we learned about each other in our class here. Just like we were focused on our own personal lives, teachers need to skillfully find ways to fit the curriculum into the students’ backgrounds. It is critical to be sensitive to an individual’s background too. I chose the words meritocracy, Eurocentric, and deconstruction. These words resonate my experience in the village school system. My teachers cared about their students, and they thought they did what was best for each student. Since the day I entered school, much of our class time was Eurocentric as classes like social studies and geography classes often focused on how the United States became the country. We learned a lot about England and why the United States became a separate country. We also learned a lot about the Native American cultures down in the lower 48, but there was no time invested on what happened to the Natives over the past few centuries. I also had to learn about the history of my hometown through my parents and grandparents. I used the word deconstruction on here as well since there was hardly any time invested on our Yup’ik culture in school. Fortunately, I had grandparents and elders who taught me outside of school. I also used the word meritocracy because we were all promised that if we work hard to become what we want, we would get it. It’s a great way to motivate students, but it can also be a great discourager to those who aren’t getting the best grades in school. Knowing my classmates, they all had the ability to graduate in school, but they didn’t have the best environment in their homes, which would cause them to not do well in school. As a result, most dropped out before graduating. Honestly, I don’t have any specific plans on how I am going to teach in a cultural responsive way. My main goal is to make each student feel valued. I will apply what I have learned here into the classroom. Students’ cultural background is important, and I feel obligated to do what it takes to teach students about the roots of their culture. I have come to learn that group projects are an excellent way to go deep. If we are using the culturally responsive curriculum standards in class, I might have to back off the lecture and basically allow the students to learn from each other through projects. But I’d need to clarify the purpose of the project so the students can see the purpose of the project. If an individual is struggling to fit in to the group, I believe there are ways to get him/her involved. When the students are in the middle of the project, I can meet with the individual personally if that’s what he/she prefers. If some things aren’t working in class, I can possibly talk with a few coworkers or classmates and discuss the classroom environment. 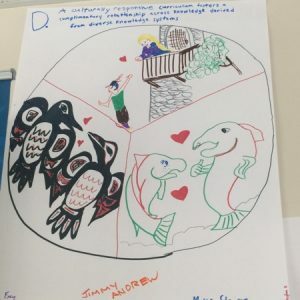 For this assignment, our group was given the curriculum standard D, which is: a culturally responsive curriculum fosters a complementary relationship across knowledge derived from diverse knowledge systems. Our group discussed for several minutes on how we can relate something from a textbook into the Native culture. Our group decided to choose “Romeo and Juliet” to draw a parallel and we chose to make our poster about it by using salmon, raven, and peter pan as characters. This standard is useful for educators who would like to teach students about another culture by finding ways to relate it to the students’ own culture. It’s difficult to see the parallel often, so this standard requires an individual to be inventive. It took our group several minutes to come up with the ideas Romeo and Juliet, salmon, raven, and peter pan. For this lesson plan, it was tough for me to decide on one particular issue. I primarily chose “history of education in western Alaska” and spent many hours researching the project, but that seemed too broad. As I got very far into the “introduction” assignment, I realized I still had a long ways to go. So I looked back at what I had, and saw that I had mostly wrote about the oral tradition among the Yup’ik culture. I decided to simplify my topic to “Yup’ik oral tradition”. Throughout my life, I was pretty much lectured by my grandpa so I was sort of able to relate to this project. This lesson can fit in multiple standards, but its mostly fits with standard A. Even though I grew up in a small Yup’ik community, I learned a lot more than I expected. I had no idea that an average of five seal skins were used to build a single kayak. I had no idea that men lived in a qasgi until they died. I had no idea that story knives were solely utilized for girls. I feel like I have learned a lot more during my research with this project than I have learned my entire life. Maybe it’s because this is the first time that I am focusing on a place I grew up during school. Most of my school years were tremendously focused on things that had nothing to do with the Yup’ik region. Maybe there were a few but they did not allow going in depth. I’m very grateful that I was given the opportunity to learn more about the Yup’ik culture. This lesson plan was a perfect task to give me more confidence about going into a Yup’ik village. I will not know how it is to prepare to be in a classroom until I am in it, but this gave me a great idea. If plan A was too broad or did not work, this was a perfect exercise to go beyond my comfort zone. I had to stay up late a few times to really dig deep. Even though I had a macbook for the past two years, I was technologically challenged since I regularly only used my macbook for internet or word. If I am struggling with a project during class, I now know what it feels like to be forced to choose a different route than your original plan. I chose this book not only because it’s fun, but also because it challenges the children in the Yup’ik culture to obey their parents. In this book, children wandered away from the village even though their parents called them to go home. Because they disobeyed, a hungry giant chases them. Fortunately, the giant forgot his knife. As the giant went to get his knife, the chickadee and crane were able to help them escape. Even though this children’s story is short, it is very entertaining. The drawings in this book perfectly portray the Yup’ik region’s scenery. 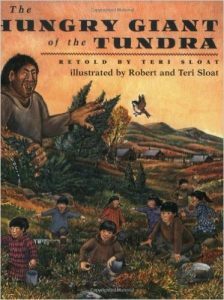 It unquestionably is a well-thought out story and encourages the Yup’ik children to obey their parents, or risk surviving. Even though I’m going to be teaching the older kids, it’s something that I’m using someway. Our group today focused on how the Caucasian people need to find their identity before ultimately finding ways to teach without prejudice toward other races. In our group, we read about how 40 students took an undergraduate course focused on racism. There were 28 White students, 28 African-Americans, and 1 Latino. One interesting thing that I read was that they had a classroom exercise where students had to select an index card on which “McIntosh’s privileges” was written. Students were then asked to read the card aloud. White students were asked to read the card as it was written, while the other students were asked to say “not” before reading it. Any student was able to pass if they were uncomfortable. The purpose of this card game was to see how some might have more privileges than others. The purpose of this assignment, as the author noted, was to see the racism embedded which was previously invisible. It was certainly hard to read. But it gave me an idea of how people felt just a few decades ago. After our group reflected on their thoughts on the book, we shifted toward our personal experiences with racism. I personally have not dealt with it, but I’ve heard and still hear stories from other people on how they were discriminated because of their race. I also hear about racism almost every day when I read news. It’s not an easy task to deal with racism. This book certainly inspires me to be careful on how I interact with people who might be less privileged than me. This book also offers different ideas on how we can teach students about racism in the future.